Brand image is important for any business because it helps to distinguish the company’s products from similar goods manufactured by competitors. For this reason, every organization should design an effective marketing strategy, which will turn customers into brand advocates and drive profitability. Instead of reinventing the wheel, marketers should better take a look at the strategies of famous corporations. They have already designed the most powerful marketing methods, which work great in the modem business environment. Everyone can learn a great lesson from the following successful practices. If you want to win over a customer, feel free to give a compliment. The few laudatory words can make a client feel valuable and special. It’s a simple psychological trick, which every marketer should use. For example, online store Romwe sends e-mails with a subject line, which starts from “Hello Gorgeous!”. There is no room for a doubt that every person, and especially women, will like this flattering salutation. As a result, a client will perceive a phrase “take $5 off” as a precious offer created especially for her. It’s not a surprise that this email had in twice higher open rate and click-through rate than the same email with a subject line “Don’t miss $5 discount”. This technique works not only with emails but also with other marketing instruments. Screenshot source: private email from Romwe. People adore holidays because they bring happy moments, long weekends and a lot of gifts. Marketers love holidays because they force clients to spend more money on presents for friends and family. Thus, marketers use holidays to kill two birds with one stone: help clients to feel a festive spirit and generate high profit. For this reason, you should never miss a chance to show that your company wants to celebrate this special day with the customers. You can place a holiday web banner at the home page of the company’s website, send a virtual postcard via email, publish a holiday post on social media, etc. 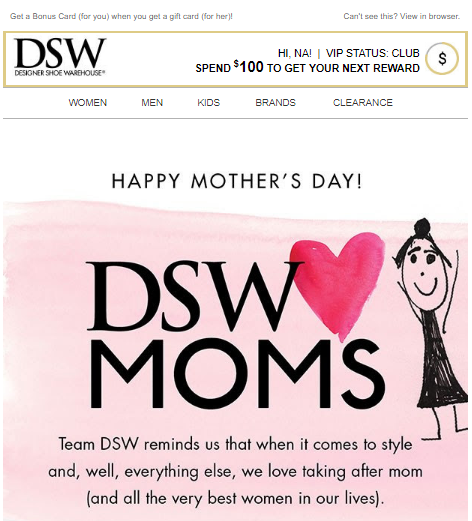 DSW company sent a cute “Happy Mother’s Day” email to its customers, which also reminded the addressees about a chance to get a reward after spending $100 on shopping. In fact, this email doesn’t contain a direct call-to-action statement, which could get a client to buy a present for his mother. However, after opening and reading this letter, a shopper will come up with a “brilliant” gift idea on his own. In other words, marketers can effectively create emotional connections, when it comes to the holiday mood. The trick is to hide the obtrusive advertising, and invisibly manipulate the purchasing decisions. Screenshot source: private email from DSW. The most powerful marketing strategies, which allow turning customers into brand advocates, are built around the loyalty programs. The best examples are the frequent-flyer programs developed by the airlines. According to the rules, a customer can get a Silver, Gold or Platinum membership, collecting the required number of miles. The more flights client takes, the higher status he gets. Most people desire to check-in additional baggage for free or have a priority for drop-off and boarding, so they remain loyal to one company or airline alliance for a long period of time. Any public or private organization in the world can design and effectively apply for a similar loyalty program. The most important thing is to choose the benefits, which are extremely valuable for the customers and set the adequate program’s requirements. It’s also a great idea to visualize the progress of your client’s achievements. Your regular customer should clearly understand, which steps he should take (how many orders to place or how many dollars to spend) to get the desirable rewards. Take a look at a great example created by KLM airlines. In the information age, it’s impossible to build a strong brand loyalty without a growing social media presence. Every company should create and manage its official social media accounts and publish fresh content regularly. Every post should contain valuable information about the products, new promotions, company news, industries events, etc. Content should be unique and original. The company can post various photos, videos, infographics, memes, and any other relevant visual elements. The major goal is to interact with the followers. 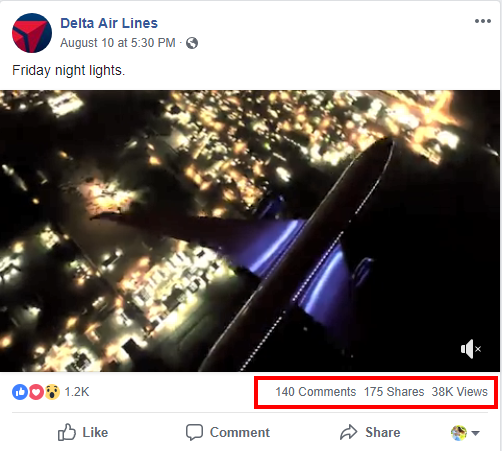 For instance, Delta Airlines shared its history in photos and demonstrated a magnificent night flight video on Facebook. These posts got a lot of likes, comments, and reposts because they were really interesting for the target audience. 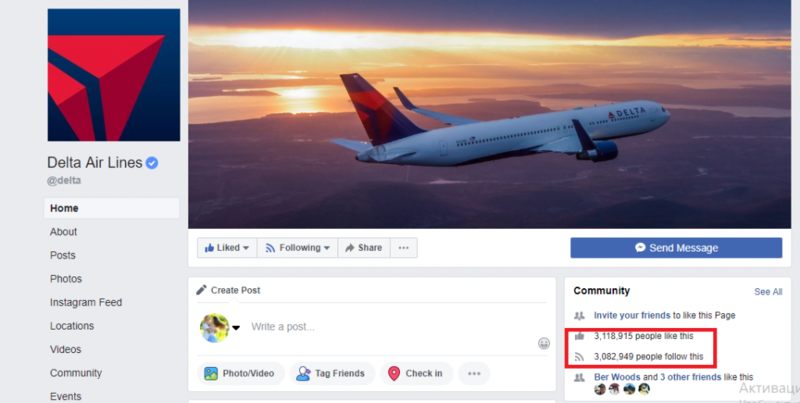 Currently, Delta has more than 3.1M followers on Facebook, while its competitors American Airlines and United Airlines have only 2.4M and 1.1M respectively. 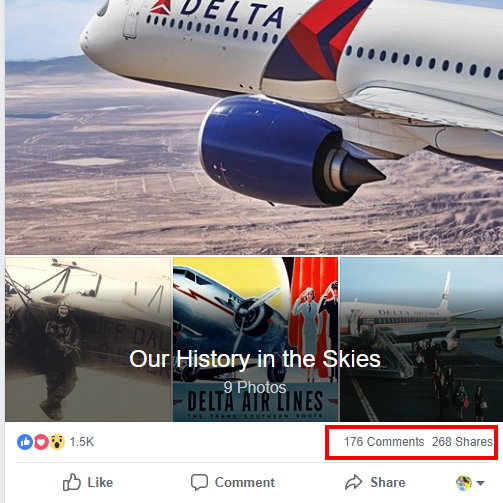 Delta has an effective digital marketing strategy, which corresponds to the brand’s value and the company’s vision and mission. Consequently, this U.S. company turns the customers into brand advocates more effectively than its rivals. Delta utilizes all tools possible to bring more regular clients to the website. 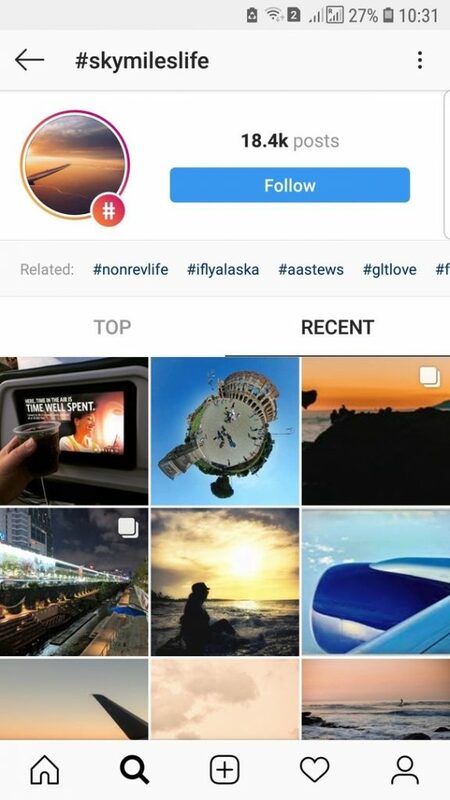 Promoting frequent-flyer programs, it called travelers to use hashtag #skymileslife, when they publish personal photos on social media. Today, there are more than 18.4 thousands of the posts with this hashtag on Instagram. When people share positive feedback about a company and its loyalty program on social networks, it greatly improves the brand reputation. 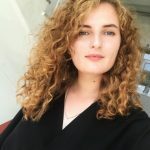 If your company needs to generate a buzz online, create a unique hashtag and encourage subscribers to use it. The feedback, whether it’s positive or negative, contains valuable information, which helps to perfect a strategy. There are many ways, in which a company can get the honest reviews. Marketers can simply conduct an online research and check what people write about a brand on social media, blogs, and forums. The company can also call customers, which have just made a purchase or contact them via email. Obviously, not many clients want to spend their time on writing reviews, so marketers should motivate them somehow. 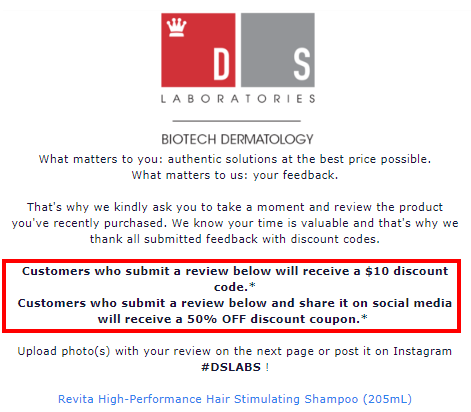 For example, cosmetics brand DS Laboratories offers monetary rewards: $10 discount code for ordinary review or 50% off discount coupon for review shared on Instagram. Screenshot source: private email from DS Laboratories. However, when the company has a huge number of customers, it cannot spend time and money on analyzing every single review; so, it designs a short survey. 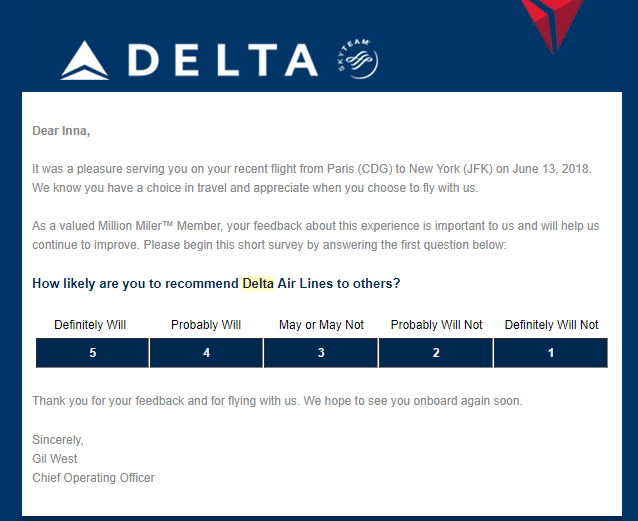 For example, Delta Air Lines ask Million Miller Members to do a short Net Promoter Survey. In this way, the company gets basic information about the services, which need some improvements. Screenshot source: private email from Delta Air Lines. To create a questionnaire for your company, you can utilize user-friendly online services. They will help you to get the necessary information and to measure their level of customer satisfaction. This is a reliable way to adjust your marketing strategy and drive brand loyalty. Clients support is another important element of the effective marketing strategy. Using the Internet, modern people buy shoes, order flowers and make a doctor’s appointments not only during business hours but also at night time, weekends and holidays. Consequently, they need help in placing orders, clarifying details and changing personal account settings 24/7. Most of the clients want to get answers on their questions right here and right now. 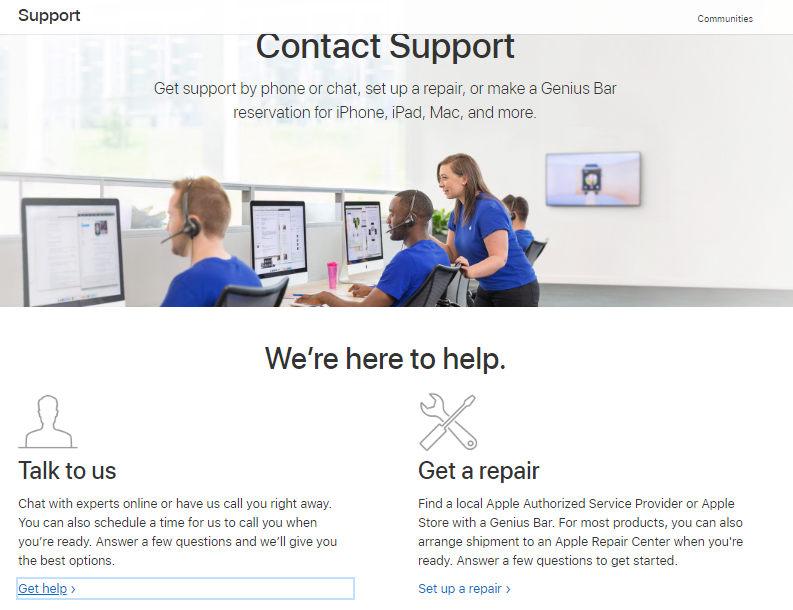 Customers should have few options on how to contact the customer support service: by phone, email, text message on Facebook, video call, etc. If a company has a lot of clients, who contact support agents from abroad, it should provide help via free channels of communication such as Viber, Skype, and Whatsapp. Customers are very loyal to the brands, which provide an outstanding support. Apple is a perfect example. This famous tech company cares about every client all over the world: experts can answer the questions in any language 24/7. When a company states that its product has the best quality ever, it should provide a long-term or even lifetime warranty. In some cases, this is a key factor of the brand’s success. For instance, JanSport company, which produces the backpacks and bags for more than 50 years, uses this marketing strategy. JanSport promises to fix the pack whether it’s possible or replace it with a new item. Obviously, thousands of people choose this brand, because they consider a bag purchase as a lifetime investment. 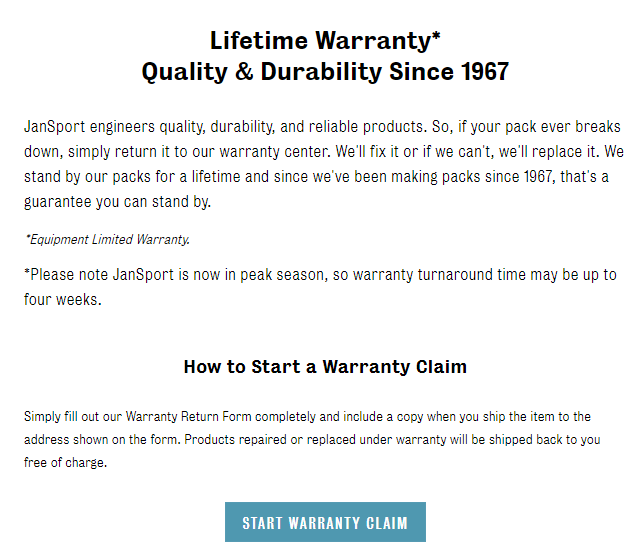 Moreover, JanSport makes it easy to request the product replacement online. The customer just needs to fill in the warranty claim form and ship a backpack to the warranty center. This is a well-known fact that post-purchase experience is crucially important for a strong brand. However, only those companies, which provide high-quality products, and are able to manage a warranty center effectively, can incorporate this marketing strategy in a practice. A company without a strong image and brand advocates is worth nothing in the modern world. Only those enterprises, which provide the target audience with a valuable offer and outstanding support, can keep being profitable in a long run. It’s useful to note that all described marketing strategies are highly effective, but they cannot be considered as a universal solution, which every company can apply. This is a marketer’s job to select the approaches, which will benefit a concrete business. In fact, analyzing the target audience’s preferences in details, it’s not that difficult to make a right choice.